Coasters prevent table finishes from heat damage due to warm dishes and hence not only a decorative table accent but also functional. Match them up with other kitchen decor items such as cutting boards, kitchen towels or napkin ring sets. Customized coasters deserve a nice presentation with our wood bases and holder. Beverage coasters made from sandstone are one of the more popular tabletop accessories. Sandstone is a natural for coasters, complementing any table, whether made of wood, glass or stone. Cork pads for the backs of the coasters protect furniture from scratches. 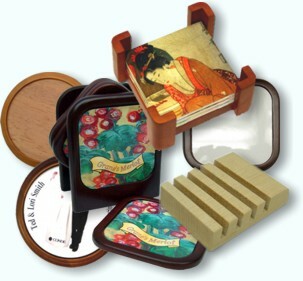 Most of our ceramic coasters include a nonskid cork backing. Two layers of soft, absorbent fabric (100% white polyester top; 100% black cotton back) protect furniture from moisture and scratching. Fabric coasters never stick to the bottom of the glass, and if they get dirty just throw them in the wash! Customized coasters deserve a nice presentation. Adding a rack to a finished set increases the value and attractiveness to the consumer. Coaster Bases: Add your own insert to these coaster bases. Your choice of porcelain, tile or frp inserts make statements of your creations. 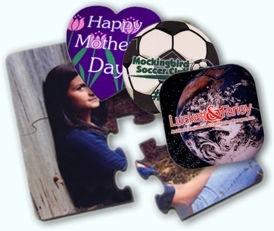 Add digital art, personal photographs or whimsical designs and extend your ideas for complete sets. Relatively new on the market is the rubber coaster -- a natural extension from the now ubiquitous rubber mousepad. 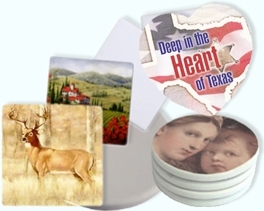 Flexible, slip-resistant and durable, rubber coasters also are washable. Condé has quality choices for you to offer your customers. As for your promotional mailers, you will find the thinner coasters fit perfectly in envelopes and add a nominal postal up-charge due to their light weight. 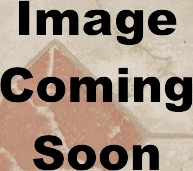 Various stone type coasters are great for vintage or rustic esthetics. 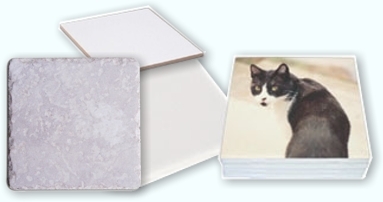 Smooth tempered glass coasters with white back, inc. bumpons. Features King Coat™ for durability and bright color results. Bumpons pictured below.